What Does it Mean When a Cat Purrs? Your purring cat may be trying to get your attention. 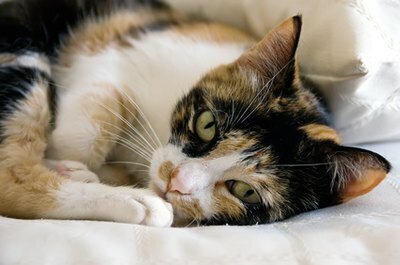 You're probably familiar with your cat's unique purr, but deciphering what she's feeling when she purrs can be complicated. While purring is often associated with contented, happy cats, it can sometimes indicate other things. Considering the circumstances she's in can help you determine the true meaning behind her purr. Contented cats often purr, which is why the sound is often associated with happiness. For example, mother cats often purr while nursing, and pet cats frequently purr when their favorite person pets them. You might also notice this common form of purring when you feed or play with your cat, or when she is relaxing in a stray sunbeam through the window. Sometimes your cat purrs not because she is already content, but because she wants to calm herself down. If you've ever noticed her purr getting louder as you place her on the vet's examination table, you can understand this. Much as putting on a confident smile can help you reduce your nervousness before a big presentation at work, a calming purr can help your cat chill out a bit when she's feeling anxious. If your cat has been injured or ill, her purr may actually be helping her heal. Purrs occur at a frequency of 25 to 150 Hz, just the right range for promoting healing and improving bone density. By purring, your cat may be trying to gently stimulate her bones and muscles without having to walk around or exercise, so she can get back to normal more quickly. Your cat may not be the only one to benefit from healing purrs. Scientists from the University of Minnesota Stroke Center found that cat owners are less likely to have heart attacks than those who do not own cats. While researchers are still studying the exact reasons for this, it may be because a cat's purr calms her human owner and helps lower blood pressure or other risk factors for heart attacks. While you might not want to admit it, and your cat certainly won't acknowledge this tactic, sometimes purrs are just a little bit manipulative. Cats who have a strong connection with a particular person will emit a type of purr called a socialization purr. This purr includes not only the low vibrations typical to all purrs, but also includes a higher-frequency vocalization that is close to the sound of a human baby's cry, according to research published in the July 2009 issue of "Current Biology." This combination gets your attention, making you more likely to feed or pay attention to the cat. You've probably noticed your feline friend using this type of purr when she tries to wake you up in the morning or when she's hungry and trying to get you to feed her. Scientific American: Why Do Cats Purr? What Is a Cat Distemper Combo Vaccination? What Symptoms Do Cats Have When They Are Around a Week Pregnant? Can Fleas Make Cats Aggressive? What Does a Cat Biting & Licking You Mean? What Do You Look for When You Think a Cat Is Sick? What Does It Mean When a Cat Buries Its Head in Your Arm?